We’re still interested in hearing from Seanetters and general allies anywhere who find these discs. SEANET will not be surprised if they make it all the way across the pond to Europe. We are also curious to know if the discs manage to wend their way farther south, so Seanetters in New York, New Jersey, and even down in our southern climes, keep your eyes peeled! You never know where these things will show up next! 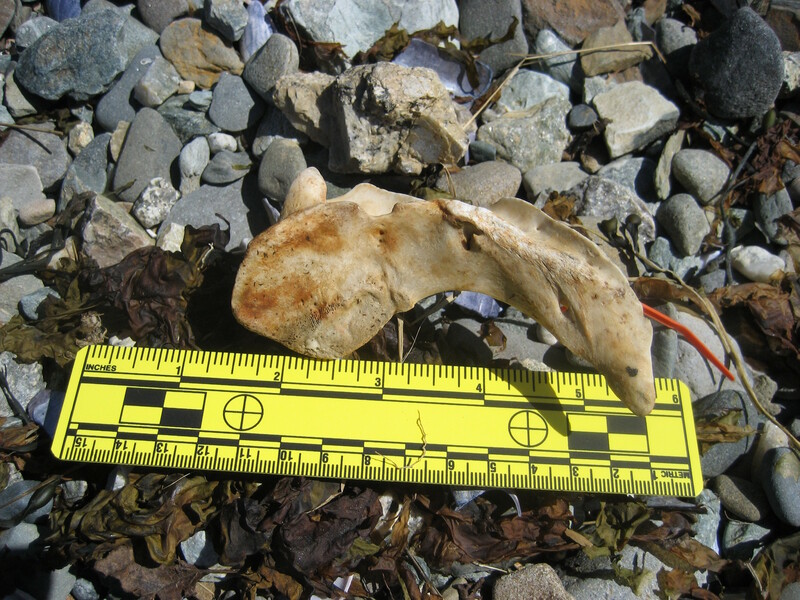 Mystery bone found by Anne Hess in April in Maine. 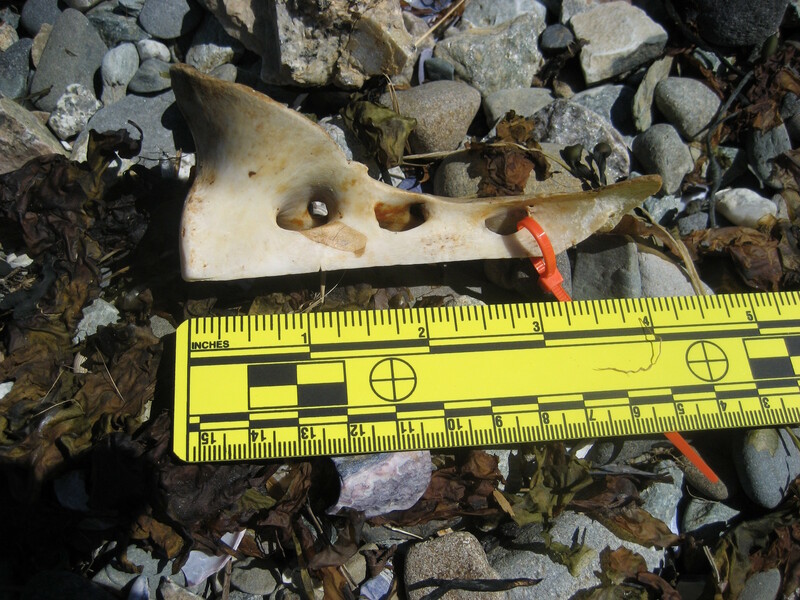 Next up, a more organic form of debris on the beach–a mystery bone on the Maine beach of Anne Hess. Thoughts, my dear Seanetters? I will, naturally, bestow mine upon you in the next post. Marine debris? There’s an app for that. Faithful readers of the SEANET blog are, I hope, committed to the idea of citizen science; we at SEANET know the immense amount of data that volunteer scientists can generate. SEANET is a particularly regimented, scheduled citizen science program, and our fabulous volunteers make a year-round commitment to regular walks on their chosen coastline. But not every publicly generated dataset requires that kind of dedication. Finding weird trash on the beach? Tell it to science! The University of Georgia and NOAA have teamed up and created a smartphone based reporting system for marine debris sightings. 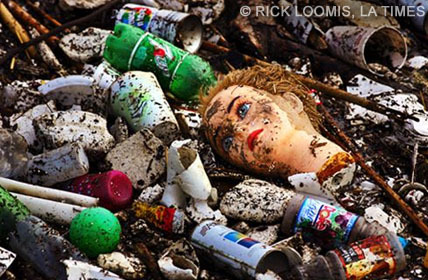 The Southeast Atlantic Marine Debris Initiative (SEA-MDI) has created the Marine Debris Tracker app for iPhone and Android devices, and users can report marine debris anywhere in the world. The data is sent directly to the Marine Debris Tracker site, and their site is viewable and searchable by the public. Debris is classified by type, with categories as specific as flip-flops and cigarettes, and the data is mapped for all visitors to the site to see. Whether you’re a Seanetter or not, give this reporting system a try and let us know what you think! “We just got back from visiting our daughter who is working in the Orkney Islands [in Scotland] on a joint RSPB/FAME project studying sea birds. Juliet spends her days catching fulmars, shags, razorbills, and others to band and attach or retrieve tracking devices, and she’s loving it. The techniques used to grab birds off the cliffs are interesting and, according to a knowledgeable Orcadian woman we met, very similar to those used when sea birds were an important food source. We went on some lovely walks along the coast, seeing lots of dramatic, steep cliffs with many hundreds of nesting sea birds. May/June is the best time to visit for weather and for bird life. 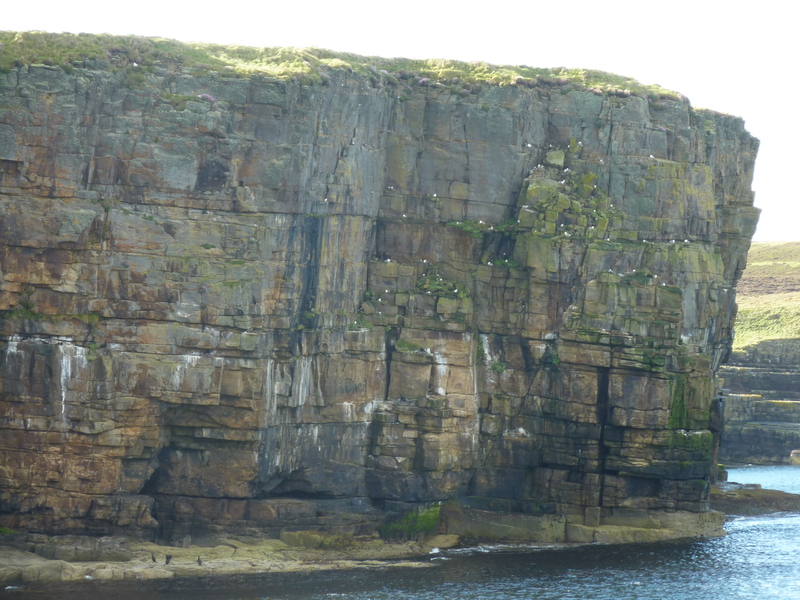 I’ve sent a couple of photos: there’s a cliff one where the little white spots are nesting fulmars, then a couple of closer ones. 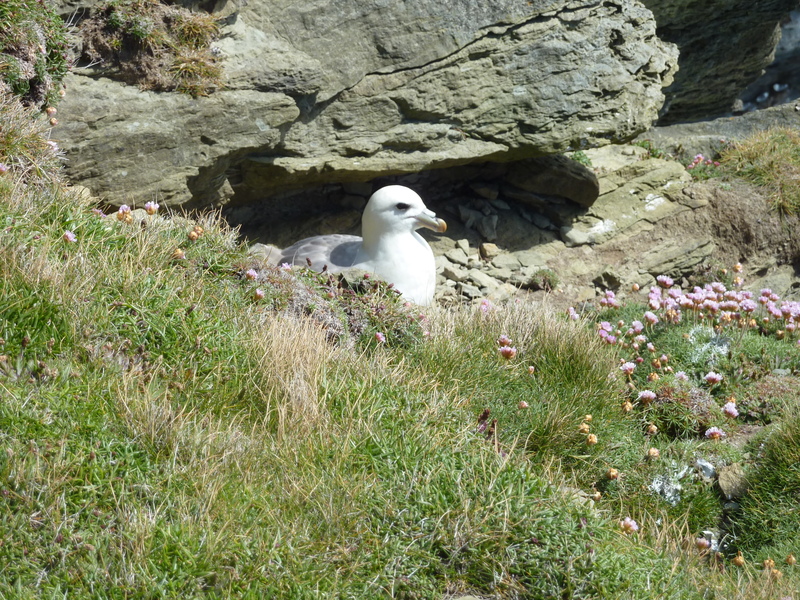 One fulmar was right near the top of a cliff where we happened to be walking and we could have (but didn’t) pick her up off the nest. Thanks for your informative blogging! First off, an answer to the question Mary Wright posted regarding the weird “band” on the shearwater shown on the previous post. 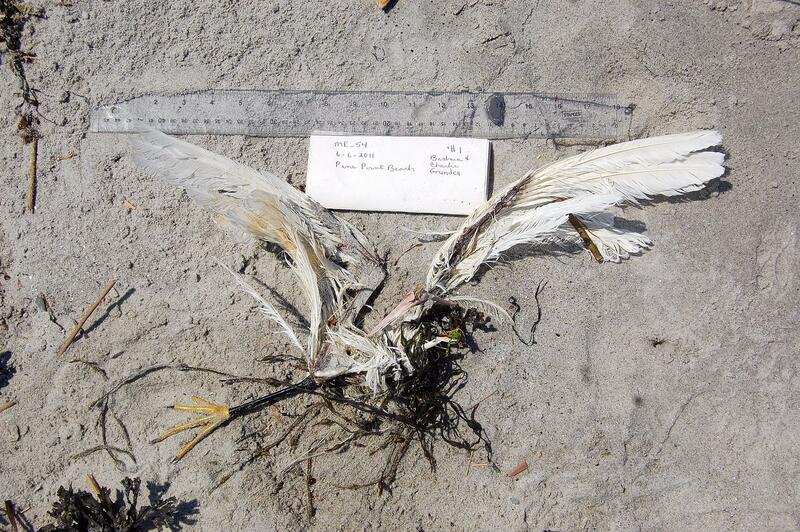 Carolyn Moore, who found the bird, says that the band appeared to be plastic. From the photo, it does appear to be either plastic or leather, and almost seems to be braided. 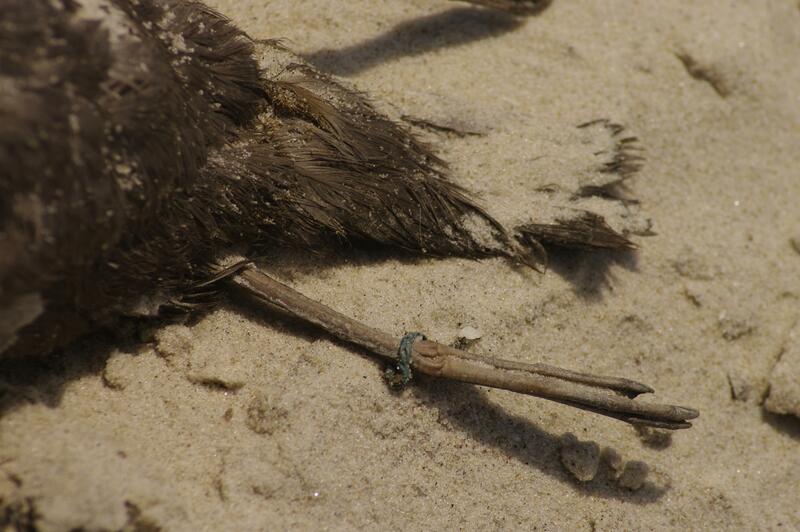 Rather than looking like an entanglement, it looks to have been deliberately placed on the bird as there is some sort of clasp or button type closure on the material. It resembles, in some ways, the jesses that falconers place on their captive animals. I have had no luck finding any kind of tracking device that looks like this thing, but I continue to ask around, and will let you know if I hear back from some of the bird tracking experts I just happen to know. And now, to slake your thirst for more procellarids (fancy/sciency term for tubenose species), here’s a two for one deal on Northern fulmars! Based on their grayish plumage, and, at first glance, gull-like bill, it’s no surprise that both of these birds were reported as gulls. Fulmars are not at all common on SEANET beaches, and our volunteers can be forgiven for not recognizing this unusual (to us) character. Fulmars breed mainly in northern Europe, though smaller colonies are present in both the Atlantic and Pacific oceans, off the coasts of Alaska and Canada. The fulmar breeding season begins in May, and birds head north from their wintering waters, which extend as far south as North Carolina here in the Atlantic. Juvenile birds resemble adults, so we don’t know if the two specimens found were young birds or not. Northern fulmars are very long-lived, and breed into their 50s. They take an extraordinarily long time to reach sexual maturity, and don’t begin breeding until 8-10 years of age, so our two dead birds may not have been old enough to breed and thus not in any particular rush to reach the waters of the northern Atlantic. 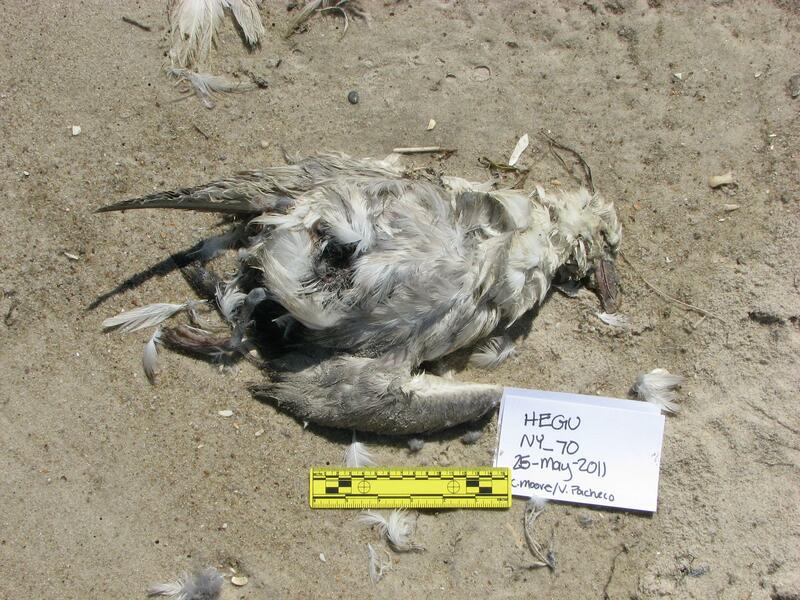 It’s also impossible to say what killed these birds based only on photos. Northern fulmar found by Carolyn Moore in New York last month. 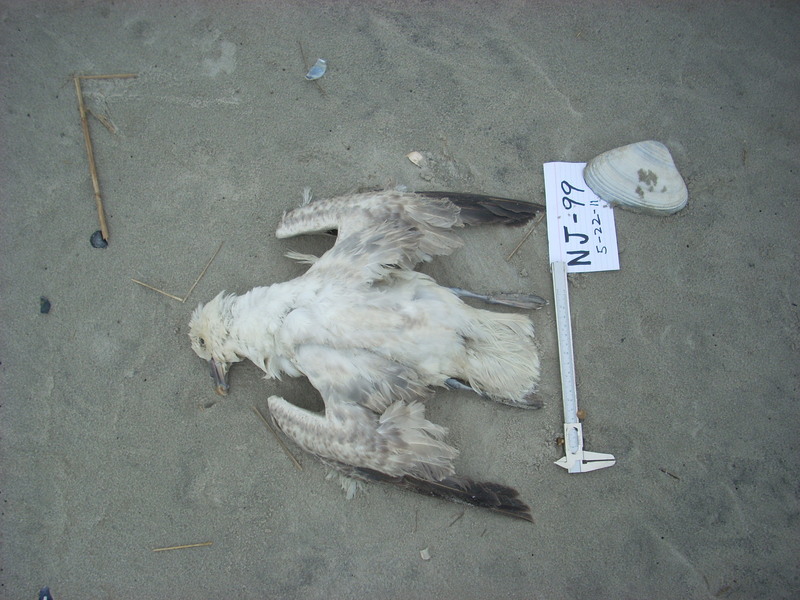 A long-term monitoring study in the North Sea over in Europe has shown a few trends in the hundreds of necropsies performed on beached fulmars there. While not the cause of death in the vast majority of birds, the most visually striking finding is large amounts of plastic in the birds’ stomachs. Depending on the location, 30 to 90% of fulmars have some amount of plastic in their digestive tracts. Birds on breeding grounds in the high Arctic tend to have less plastic than their more southern breeding cousins, but even these numbers are on the rise as plastic follows the currents into even the most “pristine” reaches of the world. The plastic does not often cause death, or even serious disease, and healthy, breeding birds often have more plastic in their stomachs than sick or dying ones, but there’s no getting around how troubling the whole scenario remains. To leave you with a some good fulmar news though, the population is in good shape. European populations of the species exploded through the early 20th century, possibly due to the supplemental food the birds gleaned by foraging near ever-burgeoning fishing fleets. For now, their numbers remain quite stable. What effect plummeting fisheries stocks and climate change will have on these long-lived, pelagic birds remains to be seen, but is, of course, not likely to be favorable. So much for leaving you with good news. 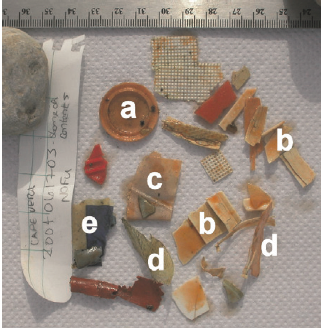 Plastic from the stomach of a Northern fulmar. Some interesting finds coming into the SEANET database lately: a sampler platter of tubenoses–the group that includes shearwaters and petrels and the like. 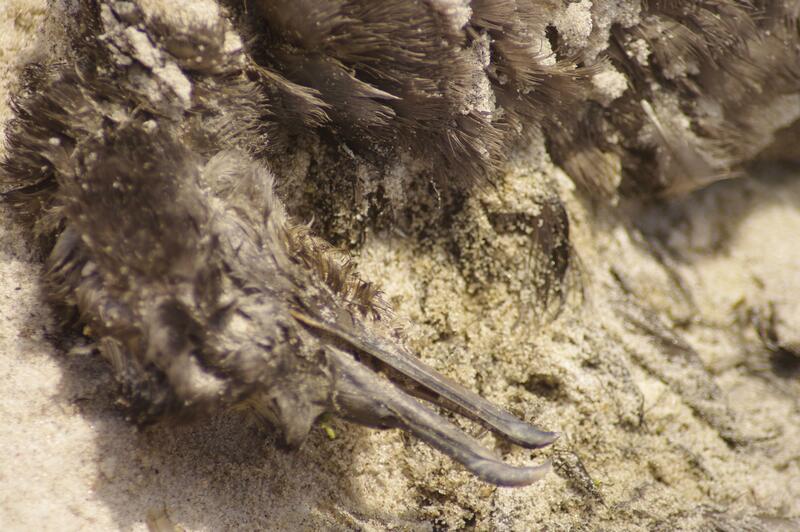 Carolyn Moore, who walks on Fire Island in New York found two sooty shearwaters over the last couple weeks. Most years, we get one or two of this species in May and June when they are traveling along the North American coast to productive North Atlantic waters. Sooty shearwaters can be distinguished from other shearwater species by the all-over chocolate brown color of the plumage, including the breast and belly. Greater shearwaters, which are also found by Seanetters with some frequency in the summer months, have a white belly with a grayish smudge. Sooty shearwaters are incredible long-distance migrants found the world over. 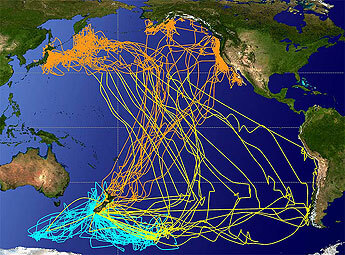 A tracking project at UC Santa Cruz in 2006 following sooties in the Pacific show that the birds appear to chase an “endless summer,” flying nearly pole to pole over the course of the year in search of feeding grounds. Breeding in the southern hemisphere in the austral summer (our winter), they then appear to make a beeline to the northern oceans seeking one of several prey hotspots near the Arctic circle. Individual birds appear to be loyal to one such hotspot, and do not appear to travel a great deal once they reach their chosen northern feeding ground until it’s time to head south again for breeding. Tracking study of sooty shearwaters: blue lines track movements during breeding season, yellow is northward migration, orange is non-breeding foraging season and finally southward return to breeding grounds. There was a mysterious detail on the sooty that Carolyn found on June 6th: a thin green band on one leg. No metal, federal band was present on the other leg, and no discernible markings were present on the green band. Your SEANET blogger will do a bit of sleuthing into potential origins for this charming anklet, and should I turn up any information, you will most certainly read about it here. The other notable tubenoses to report turned up in New York and New Jersey. But as I wish to keep you riveted, dear readers, I will reserve the remaining tubenose news for a post later this week. Little Egret: the Euro version of the snowy egret. Snowy egret: decidedly western hemisphere. Bird A, fortunately, has a very tell-tale detail still extant on its otherwise well-decomposed carcass. 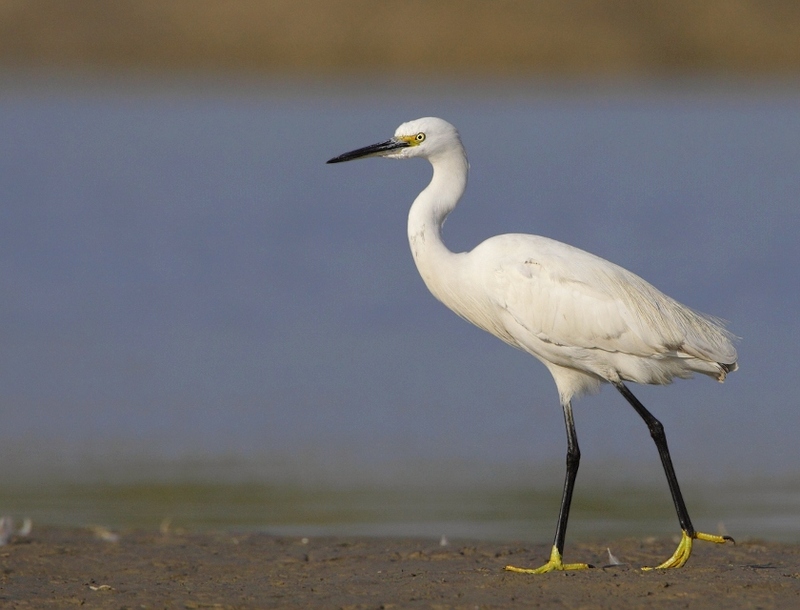 The bright yellow foot, clearly demarcated from a black leg marks this bird as snowy egret. Most likely. What else could it be? The odds are very low, but the Eurasian species the little egret looks almost identical and is an occasional visitor to North America. 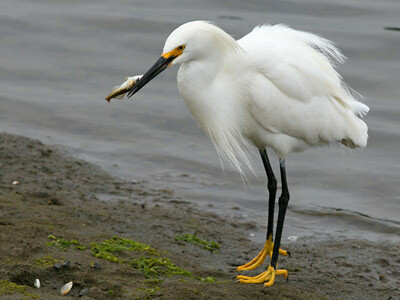 If we’re playing the odds however, we’ve got to go with snowy egret. Other possibilities to entertain don’t fit this bird exactly, but for our southern Seanetters in particular, the wood stork could present a somewhat similar “foot look.” If the entire carcass were present, it would be difficult to confuse the vulturine, bald-headed wood stork with any egret. But based on the legs alone, wood storks have dark, grayish legs with a lighter, pink to yellowish foot. Since colors fade in dead birds, a weathered carcass could trick an unsuspecting Seanetter. 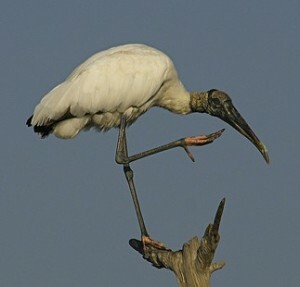 The wood stork: another species with a two-tone leg/foot combo. Bird B is a very aggravating enigma. I do not know what this thing is. Some thoughts I’ve had on the matter: It seems to have a central black dot on the breast–maybe a song sparrow? 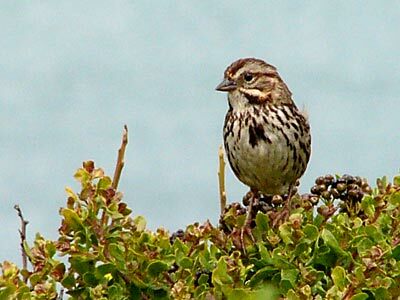 savannah sparrow? I don’t know. It seems sparrow-ish. With my passerine i.d. skills, it could be something else entirely, like a longspur or something. Let us say, “unknown sparrow” and have done with it. Today, I submit for your consideration a couple of birds not in the seabird category, but which turned up during SEANET surveys. Bird A is a real challenge, and I am not sure of its identity. Neither is bird nerd, ultra-ornithologist David Bonter, with whom I consulted. So I genuinely wish to hear your feedback on this quiz. Answers to come at an unspecified interval. Bird B: Found by Barbara Grunden in Maine this month. Bird A: Found by Paula Kane in Maine last month. 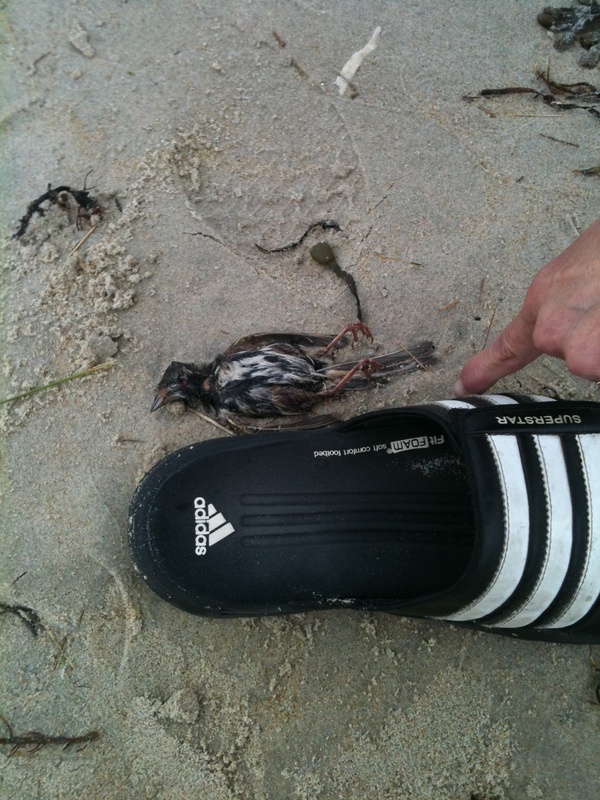 Sandal provided for scale; presumably not used to smoosh the bird to death.